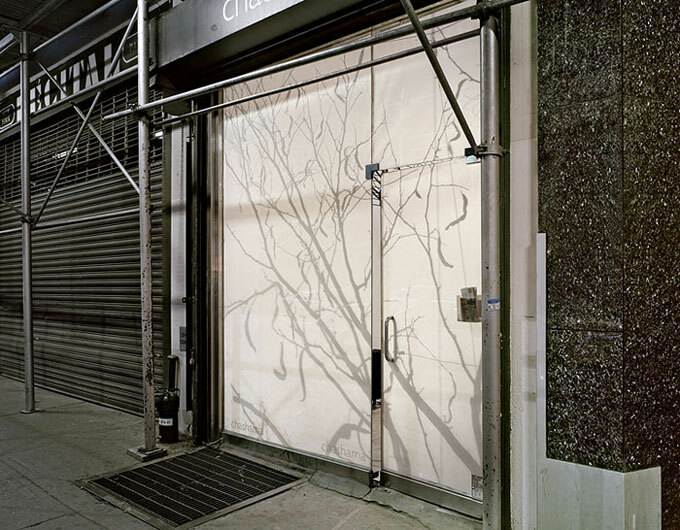 Sited on gritty block in Garment District, Paradise Pictures transforms the large storefront window of the gallery into a screen that receives the shadow of a locust branch cast by a lamp positioned at the back of this triangular space. The locust branch was brought from Philadelphia where it fell into Torchia’s backyard garden from the top of a neighbor’s tree during a storm in late October of this year. Torchia, who was out of the county at the time, returned home to discover his patio filled with yellow foliage that was there when he left. The cracked base of the fallen treetop landed directly inside the ring of a circular steel vine trellis at the back of the garden (as if had been aimed there). Nothing in the garden, including a glass tabletop supporting the branches, was damaged. Capitalizing on this windfall, the project plays on the meaning of paradise as a “walled garden”. 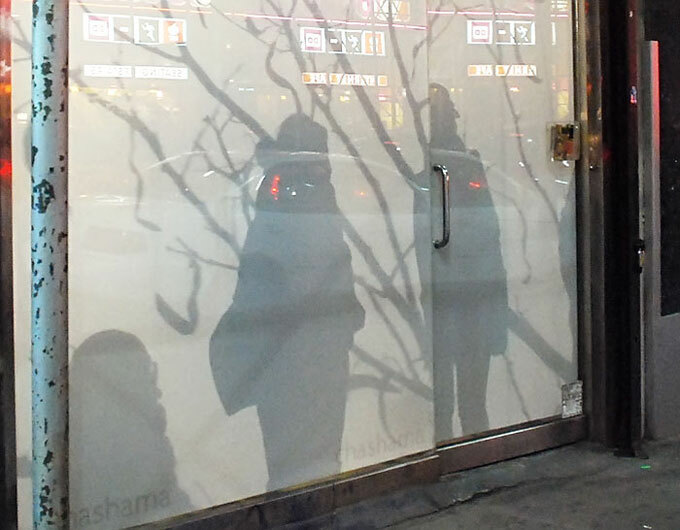 Suggesting what might be seen as a random, optical phenomenon, the installation frames the effects of urban tree shadows to reorient our sense of nature and culture, inside and outside. 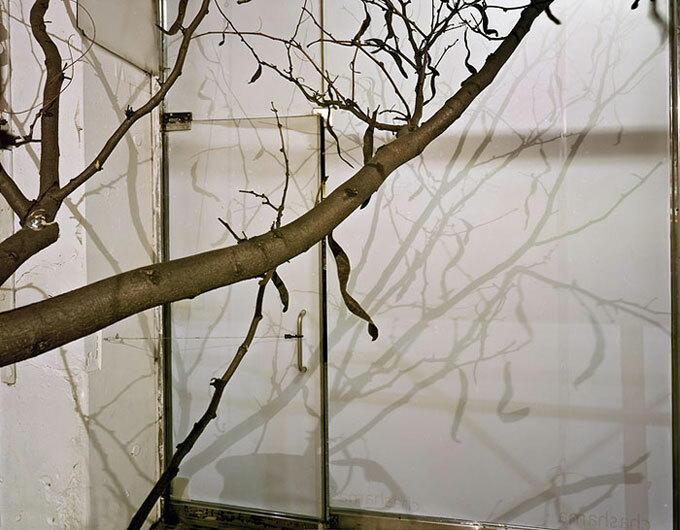 Harnessing the combination of given conditions—winter weather, heat issuing from the exhibition space and the scaffolding that currently shades the glass storefront, the installation also offers the possibility of regarding the movement of the branches as a kind of performance. Paradise Pictures extends Torchia’s ongoing work with the camera obscura and his interest in the instantaneous formation of images. The shadows of trees are among the most primitive examples of nature’ s capacity to create spontaneous graphic images of itself. Henry David Thoreau, writing in his journal about the “ rich tracery” of the shadows of elms he saw in the light of a half moon in 1851, was moved to comment that “men had got so much more than they bargained for—not only trees to stand in the air, but to checker the ground with their shadows”. Torchia is interested the ways in which such shadows, when thrown onto the flat planes of urban walls and streets, not only become more legible but also appear more ephemeral. 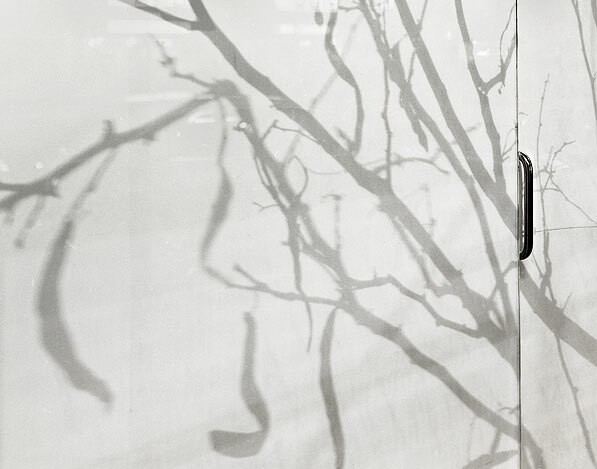 Whether created by the sun or artificial light sources, when cropped and contextualized by city surfaces, the shadows of moving foliage take on the character of mediated, cinematic projections without losing their delicate and fugitive immediacy. The project is directly related to A Beam in the Bower, a permanent public video archive of tree shadows (developed with Aaron Igler and LURE) to be projected onto the shaded wall of the Hilton Garden Inn (Philadelphia) starting in the spring of 2009. 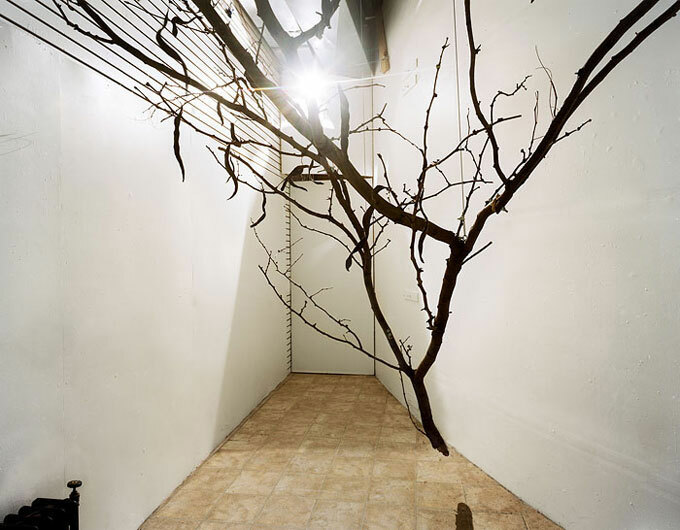 A resident of Philadelphia since 1987, Torchia has been exhibited his work in solo projects at the Institute of Contemporary Art (University of Pennsylvania, Philadelphia, 1994), the Center for Creative Photography (Tuscon, Arizona, 1987), Historic Eastern State Penitentiary (Philadelphia, 1997-2001), the Gallery of Photography (Dublin, 2002) and Evergreen House, The Johns Hopkins University, (Baltimore, Maryland, 2006). His work was last seen in New York at Wave Hill (the Bronx) in the group exhibition “Thoreau Reconsidered”.